According to my web statistics a fair number of people are finding my site by searching for "Julian Beever's Life". 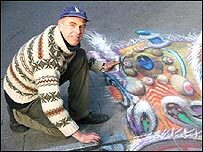 I guess they must be discovering an old post of mine on Julian Beever's optical illusion pavement drawings. Unfortunately I don't know very much about his life, but I'm always willing to please so I'll tell you want I do know. According to his website has been making pavement drawings for over ten years and has worked in the U.K., Belgium, France, The Netherlands, Germany, the USA and Australia. Apparently he started pavement drawings to finance his travels around the globe. For those who still want to know more, Eric Shackle has an interesting article, relating to Julian's recent pavement drawing in New York's Union Square.